The Rescued film project aims at developing and archiving film rolls that, for some reason, were left undeveloped. In this video they present their work, and more specifically when they discovered 31 rolls shot my an American from WWII soldier. The photos can be seen on their website. Three days ago one of my photos on Flickr was invited by the Yahoo! staff in a group for some news related use. I had no real idea where it would end up and supposed it could be an illustration for an article or maybe their blog. I accepted nonetheless. Yesterday I was delighted to hear from a contact that my photo appeared in the trailer of the new Flickr App for iPhone. Attending a photo exhibition on Sunday motivated me to take my camera with me again. Not to go out and shoot, rather just in case, for those “would make a nice photo” moments. While commuting back from work in a half empty train on Monday, there was such a moment. This man sat in front of me and soon he tried to sleep. But although his eyes were closed, I could see he wasn’t sleeping (unlike so many Japanese commuters who just instantly fall asleep, often in the middle of checking their mails). His face looked calm and unworried. 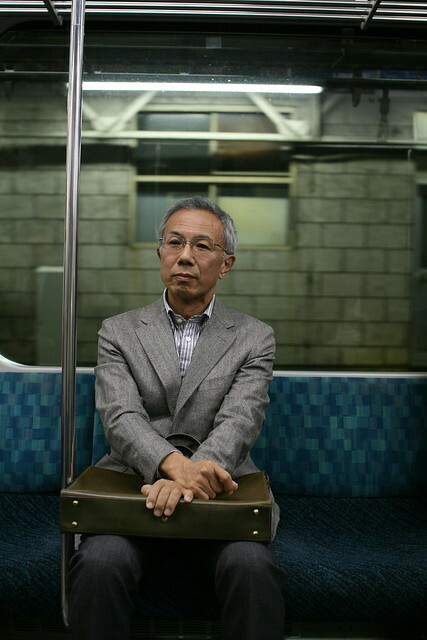 With the empty seats, I thought it would make a good image as soon as some motion through the window would contrast with his quiet looking. But before that moment came, another commuter sat next to him. I spent a while wondering if I just missed the shot or if I should take both of them anyway. I liked his face and kept staring at him, after he gave up on sleeping, waiting for an eye contact so I could take his portrait. That moment didn’t come either. Finally I took my camera and aimed anyway. After a few seconds, I pressed the button. Anyhow–whatever the reason for my animosity–I saw this couple, hated them and flashed at them. Three times. Each one capturing a slightly more shocked expression. It was my intention. I wanted people like this to be outed in some way–I found it appropriate to shoot them in the same way as a paparazzi would. So goes a recent interview of Charlie Kirk, British photographer going by the handle Two Cute Dogs. 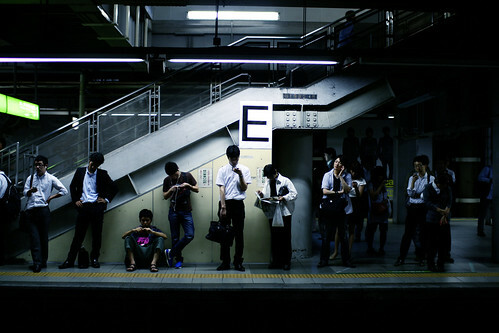 Although now living in UK, Charlie had been in Tokyo for many years and doing street photography. That’s about all I know about him, the rest is guess. A strongly opinionated person I’d dare to assume. I can only recommend you to have a look at his work (on Burn My Eye, on Tumblr, not on Flickr anymore; note it can be NSFW). His style is remarkable, using flash to take street portraits in an intrusive, aggressive manner. Some of his shots are truly fascinating. In the interview, he explains how he took what would become his single most famous shot. The point of this post was only to mention that interview, but while I’m at it, here is a documentary by Adrian Storey. There’s even a TL;DR version, ahem, trailer. Everywhere and especially in Tokyo people put on a mask of sorts to project an image of how they want people to see them. Charlie’s work is as if he pulls off that mask, then captures what’s under that mask to reveal something more interesting. Of course this isn’t for everyone and some people don’t like it, but in a sea of mediocrity and many relying on post production to make their photos interesting Charlie is a breath of fresh air. Noah Kalina has been taking a self portrait every day for over twelve years, and uploaded yesterday on Youtube a new time-lapse video of this work in progress. There are a couple of such videos on Internet, but this one is the longest time span I am aware of. During seven minutes, you can not only see how his face evolves as he ages, but also get a glimpse of his outfit style as well as his professional and personals lives.